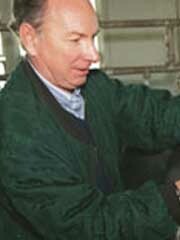 William Thatcher is one of the world’s leading authorities on bovine reproduction. He has applied his basic research on dairy cattle reproduction to produce breakthrough discoveries in methods for reproductive management of dairy cattle. By adapting his research to address problems unique to Florida, particularly its sub-tropical environment, Thatcher also has made discoveries that are valuable to many other parts of the world. Thatcher’s research has concentrated primarily on two windows in the reproductive cycle of the cow that are susceptible to disruption and amenable to control. These windows include regulation of ovarian follicular development and maternal-embryonic communication. Thatcher also has developed an understanding of the roles nutrition and heat stress play in pregnancy. Thatcher’s recent work on ovulation control in cattle represents a dramatic advance in the field. His system for ovulation synchronization using a variety of hormones eliminates the need for estrous detection – which is time-consuming and often inefficient. The system also would allow farmers to inseminate all their cows on the same day. It is estimated this system could save dairies $4.6 million the first year it is used in Florida. Thatcher and his colleagues also are studying how an embryo communicates to its mother that she is pregnant. Somehow, very early in pregnancy, the embryo signals a reduction in the hormone prostaglandin, allowing the hormone progesterone to prepare the uterus for implantation. If this signal is too weak, the pregnancy fails.